Stukis-wet-774 - Shaw-Swift Canadian Co.
Carl William Walin was born in Wilmar, Minnesota, April 11, 1900. In 1903, he moved with his family to Clive, Alberta. In 1910 the Walin family moved to Hughendon, Alberta. 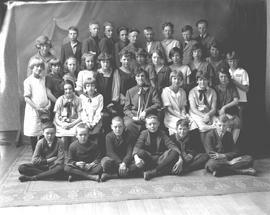 In 1916, Mr. Walin traveled to Illinois to study at the Eastman Kodak School of Photography. Upon completion of his studies, Mr. Walin apprenticed with a photographer in West Virginia. After working in a Maryland shipyard in 1918 to aid the war effort, Mr. Walin returned to Canada in 1919 and purchased F.L. Talbot photographic business in Wetaskiwin and renamed it the Walin Studio of Fine Portrait Photography which he operated until 1956 when he sold the studio to Bert Jasperse. Mr. Jasperse at first retained the name Walin Studio of Fine Photography but eventually renamed the business Jasperse Studios. For a period of time in the 1930s, Mr. Walin also operated film development services called Artistone Studio. In 1922, Carl Walin married Dagne Billsten of Malmo, Alberta. The Walin's had one daughter Leone and one son, Dale. Dagne Walin died in 1943. In 1960, Mr. Walin married Pearl (Pat) Gould of Brandon, Manitoba. Mr. Walin's photographic abilities were widely acclaimed and he was the recipient of several awards, including two merit awards from the Professional Photographers Association of America. Additionally Mr. Walin was accredited to photograph Royal Tours of Canada. Mr. Walin's photographs are an important chronicle of early to middle twentieth-century life in Alberta and especially significant for those interested in the history of the Wetaskiwin area. Mr. Walin died in Edmonton in 1966 and is buried in Wetaskiwin. The majority of the records consists of the records of the Walin Studio of Fine Portrait Photography and was given the accession number 98.37. When the Walin Studio of Fine Portrait Photography ceased operations in 1956, Mr. Walin sold the studio and images to Bert Jasperse of Wetaskiwin who opened and operated Jasperse Studios in the same location. In the early 1990s, Bert Jasperse, upon his retirement and the closing of Jasperse Studios, sold the Walin images and records to the Samson Cree Nation in Hobbema, Alberta, who were interested in the collection for Walin's portraits of early twentieth century native life. The Samson Cree Nation separated images pertaining to native life and sold the remainder of the collection to the City of Wetaskiwin Archives in 1998. Accession 88.7 was donated to the City of Wetaskiwin Archives by Leone Provost, Carl Walin's daughter in 1988. Fonds consists of materials created by Carl Walin through the operation of the Walin Studio of Fine Portrait Photography in Wetaskiwin Alberta from 1919-1959. The fonds consists of these series: 1. Old-time Wetaskiwin (1919-1953) Series consists of photographs of early Wetaskiwin personalities, groups, street scenes, buildings and landmarks photographed by Carl Walin and separated by Walin from the general collection. 2. Walin Studio of Fine Portrait Photography- Artistone Studio (1919-1956) Series consists of the administrative records and photographs created in the course of day-to-day operations of the Walin Studio of Fine Photography and Artistone Studio. Photographs include wedding portraits, baby portraits, family portraits, pictures of service personnel, graduation photos, school and church confirmation groups and other personal events. There are also photographs of the Wetaskiwin area, landscapes, group scenes and other non-personal photographs. Includes nitrate negatives, glass plate negatives, acetate negatives and prints sized 5x7, 8x10 and 10x17. The administrative records of Walin Studio of Fine Portrait Photography are subject index cards arranged chronologically by years. The records within an individual year are arranged alphabetically. Photographs from the Walin Studio of Fine Portrait Photography series are arranged chronologically by year. Due to the poor condition of some of the negatives, restrictions may apply. Please consult the archivist for further details. An inventory is available for accession 88.7. A preliminary inventory has been prepared for 98.37. The Provincial Archives of Alberta holds records of Carl Walin in accession PR1966.81. The Historical and Archival Department of the Samson Cree Nation also has materials created by Carl Walin.